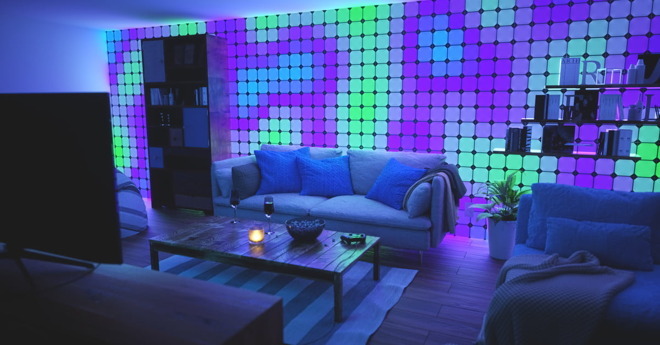 An early version of Nanoleaf’s HomeKit-compatible Canvas light panels. “Though the  smart home market will essentially be dominated by two companies, Amazon and Google, Apple is also expected to gain traction in the coming years,” it said in a report. Amazon Alexa and Google Home are so far the most dominant consumer smarthome platforms in terms of compatibility, aided by matching low-cost smartspeakers. Last week Apple introduced several new services: Apple News+, Apple Arcade, Apple Card, Apple TV Channels, and finally Apple TV+, its original video platform. Alongside that it revealed that its redesigned TV app would come to third-party smart TVs and streamers, joining AirPlay 2 and HomeKit. HomeKit has enjoyed reasonably healthy support by accessory makers like Hunter, ecobee, Philips, and Honeywell, but Apple’s one smartspeaker — the HomePod — is normally $349. People who just want voice control and/or already have high-quality speakers can get an Amazon Echo Dot for $39.99, or a Google Home Mini for $49. A rumored “cheap” HomePod has yet to manifest. Apple’s December-quarter share of the global smartspeaker market was recently estimated at 1.6 percent. That’s a far cry from Amazon’s 13.7, and Google’s 11.5. Perhaps more importantly, Amazon and Google’s smarthome platforms are typically considered easier to develop for. For years Apple required that HomeKit accessories have a dedicated chip for handling its tough encryption, and while decryption can now be done in software, developers like August have complained that HomeKit still requires extra effort. In fact only recently have brands like Netatmo and Robin begun launching HomeKit-compatible doorbells, despite that technology being a marketing centerpiece for the iOS Home app in 2016. Two of the most popular doorbell brands — August and Ring — once promised HomeKit compatibility but appear to have backtracked.